The Istituto Poligrafico Zecca della Stato, or IPZS, has issued (13th March) a new, smaller-sized gold coin that also launches a new series focusing on the emperors of Rome. 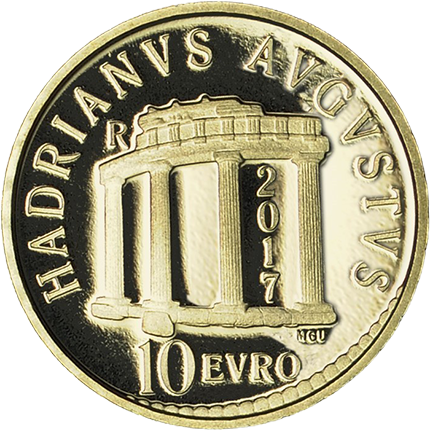 The first coin in the series features Hadrian (AD 26–138), who ruled the Roman Empire from 117, succeeding Emperor Trajan until his own death 21 years later. Hadrian is remembered for the substantial expansion of the Roman Empire’s territory, extending the borders of the empire right up to the northern half of the province of Britannia. The border was finalised with the construction of Hadrian’s Wall, which today continues to define the border between England and Scotland. He extended the territories as well as presiding over an extensive era of peace, issuing policies considered wise and prudent during his administration. Described as an intellectual and as a connoisseur and admirer of figurative arts, literature, poetry, and architecture, he is credited by historians with the creation and approval of some of the most important buildings in Rome and the wonderful Villa Adriana in Tivoli. He was considered the most well-travelled emperor of his time, visiting nearly all provinces within the empire—especially the city of Athens, which he wished to make the empire’s cultural capital. 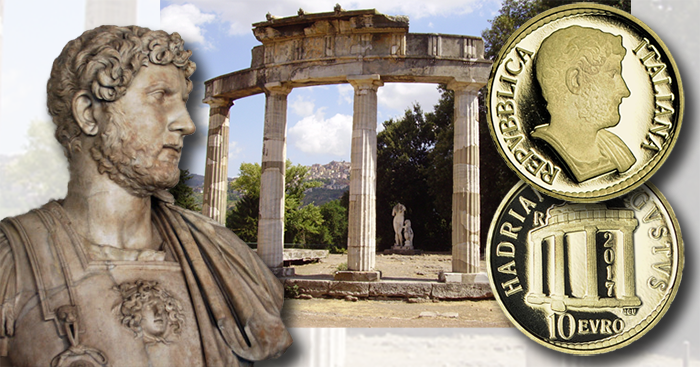 Hadrian approved the construction of many lavish temples and places of public assembly during his reign. In order to secure the succession of the empire’s throne as he would wish it, Hadrian adopted Antoninus Pius (AD 86–161), one of the four proconsuls who administered the province of Italia in 138, on the condition that Pius adopt Marcus Aurelius (AD 121–180) and Lucius Verus (AD 130–169) as his own heirs, so they would eventually succeed Antoninus as co-emperors. Hadrian died in the town of Baiae, a mineral springs and coastal resort on the northwest shore of the Gulf of Naples during the era of the empire. The coin is designed by Maria Grazia Urbani. 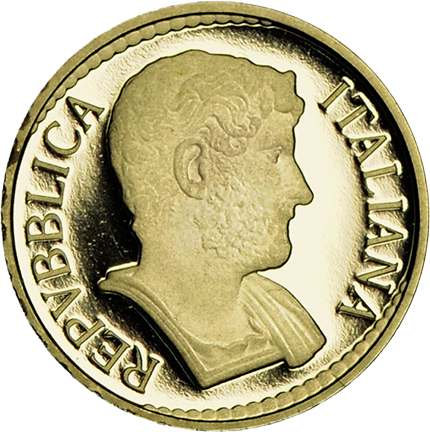 The obverse includes a right-facing bust of Hadrian, which is inspired by a portrait of the Roman Age preserved at the Uffizi Gallery in Florence. The inscription REPVBBLICA ITALIANA is placed on either side. Above and below the portrait are a series of dotted decorations. The reverse depicts the ruins of the Temple of Venus at Villa Adriana in Tivoli. The inscription HADRIANVS AVGVSTVS is placed above the primary design. To the upper left of the temple is the letter R, which identifies the Mint of Rome; the year 2017 is placed vertically between the two right-most columns. At the base of the ruins are the designer’s initials, MGU, and the value 10 EVRO is placed below the temple along with dotted decoration.